The more you learn and grow from a place or person naturally; the most you get attached to it. If you can imagine how much a young woman learns from living abroad for a year, you might start to understand how attached the woman would get. Living in Italy for a year I learned another language, made foreign friends, traveled the world, loved, laughed, cried, relied on myself, relied on others and realized realities, all the time living the unreality of a fairy tale. Throughout the experience I developed a friendship with 'Gabby,' a girl who became the truest of friends and after completing our journey together in Florence we sat facing the final week of our stay in Italy, what exactly could we do? We needed a hailing, a final Italian adventure and when our photography professor invited us to a party near the beach; we thought we may have found it. Still, it wasn't just a party we needed. We needed to take all the elements which had been our Italian experience and manifest them through one final excursion. We decided to go to the party, on a motorcycle. We scheduled to rent the bike the morning of the party; we would drive the 4 hours to the event, socialize, spend a few days on the beach and motor back. The morning of our departure Gabby woke with a fever. We decided to miss our schedule departure and let her sleep more. After some time Gabby conjured the strength to journey down to the rental shop. We filled out the necessary paperwork and were presented with our machine: a shiny blue Honda 500, with a few dings and sporadic spots of rust telling of its demanding occupation as a rental bike. Not having driven a motorcycle in a few months, I took it around the block to get back in the groove. After a few laps I felt confident enough to pick Gabby up and start the adventure. We merged onto one of Florence's busiest streets and cruised toward the highway. We felt a little more liberated then usual from our new position of agency astride our motorcycle. We flew out of the city toward Pisa taking in the sights and color of Tuscany. After an hour I decided to stop for a rest. As we dismounted at the rest station Gabby groaned from the weight of our luggage, which she had been hauling in a backpack. Recalling my own pain from riding with a backpack in the past I empathized with her and also marveled at what a trooper she was. We were doing this trip come fever, back ache or any other evil which may plague us. We arrived on the beach and grabbed coffee in little boardwalk cafe we had scheduled to meet our professor at. She arrived and guided us back to her house. She had a casual flat with a view of the sea from the patio where she slept under the stars during the summer months. We prepared ourselves for the party in our room. Eventually the music from the party started and we made our way up to the garden to meet the guest and socialize. The party was warm and intimate, the soft strings of lights lit the garden area as family and friends ate danced and shared stories. We went to bed feeling happy to meet the personalities and hear the stories which only can be produced by Italians. The next morning we headed to the beach and tanned ourselves on the Mediterranean sand. It was a quiet time full of reflection and memories of the experiences of the past year. In true Italian fashion we had a long, late lunch. After many hours of socializing the Sunday was growing late and we knew Florence was calling us home. We said our goodbyes and thank you's and got back on the bike for our ride home. We needed gas and stopped at the first gas station on the outskirts of town. There were 4 options of fuel, some labeled 'gasolio', some 'diesel.' Well let's stay away from the 'diesel' I thought as I reached for the gasolio gas, right, I mean how far off could it be? Far, I found out as my tank brimmed full and the station attendant raced out of the building shouting and waving his hands. We discovered in loud, angry Italian, that even gasolio is diesel fuel and unlike in America where we normally have 3 unleaded options and 1 diesel, they have many diesel options and 1 unleaded option. We stood there in the gas station, a rented bike needing to be returned tomorrow morning to Florence, a tank full of diesel and an angry Italian man still yelling at us. Possible scenarios of ruining the bike, not getting it returned or working the next year of my life to pay this off ran through my mind. After a brief internal breakdown I pulled myself together and began to think logically. The gas had not entered the motor, so it was safe. 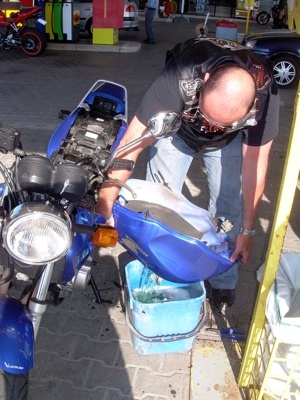 I pushed the bike into the shade and examined the tank, if I could get it off, I might be able to drain the fuel. I asked the attendant for assistance and he scowled and stomped back inside. We followed him in and while the trip thus far had highlighted all the things we loved about Italy, we started to remember all the things we HATED about Italy. He wouldn't help us because he wouldn't, period. The shop in town would not open until Tuesday and Italian speculation said the bike probably wouldn't be look at until Thursday, due to all the 'work' (AHEM coffee breaks) which would congest the situation. There were no tow trucks in town and now move along little blonde American girls. I gritted my teeth, these were NOT options, while they might be for an Italian, we were American and anything is possible! We were fixing this machine and driving back to Florence TONIGHT and that's where MY period went. I asked to borrow some tools, he gestured to a clean set of untouched ratchets and wrenches, I scooped them up and stomped outside. I would take off this tank and dump it all over his snotty little gas station, I thought, as months of dealing with prejudice and attitude came back to me. I sat down and started removing the tank. Italians came and went through the station, fueling, staring, staring, then leaving. Gabby and I exchanged glares, typical, they can stare and that's about it. To my surprise I had got the tank off in a few minutes except the fuel line. There must be a way to turn off the flow of gas, even though no matter how mad I was I didn't truly want to spray gas everywhere. Gabby and I eyed the line and our options as a group of Harley riders thundered into the gas station. A female rider came over to us and we discussed our predicament, she immediately called her boys over it and after they finished snickering at us they yanked the tank off and dumped out the wretched diesel. They filled it with water and a big Italian in his leather vest picked up the tank and asked us if we preferred 'shaken or stirred' as he rinsed out the remnants of diesel. They plopped the tank back on and then asked for a few pictures. We posed with our heroes and exchanged contact information amidst endless expression of gratitude. 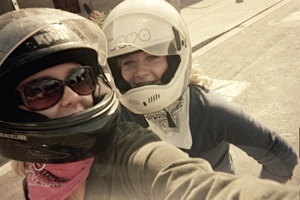 We cautiously got on our motorcycle, and turned it on. It came to life and didn't let out so much as a cough as we took off. We held our breath for a few miles and slowly started to relax as the cycle really did seem to be stable. We rode through the setting sun and entered the Florence toll booth as night threw a purple blanket on the ancient city. The toll booth attendant joked around with us in Italian; two blondes on a bike are not the norm. We stopped by our friend's apartment and called him to come down to the street. He come down and nearly fell over from surprise as we sat proudly on our motorcycle. We recounted our story which had him rolling as we added another cultural faux pas to the list he had already witnessed this year. The next morning we took the bike for a final tour to the hill which over looked Florence. We gazed out of the city knowing, in all its catastrophic occurrences, the adventure really had been the most faultless exit to this amazing city which had been our home for the year. We glided back down into the city to drop the machine off at the rental shop. We retrieved our deposit and quickly left, before they stuck their nose in the tank. Technically the trip was a bumpy road, but in reality there couldn't have been a more perfect farewell. Ups and downs, we learn from both, while these ups and downs were radically contrasting in Italy the extremity allowed for so much more knowledge and understanding to be harvested from the experiences. Gabby and I had lived the year in a weekend and knew we would never forget either.